청자퇴화화문 주전자 및 승반은 주자와 뚜껑, 승반이 제격으로 갖추어진 완전한 한 세트로 작은 원판형 뚜껑에 주자의 몸통은 공처럼 둥근 구형(球形)을 이루었으며, 구연이 크게 외반된 승반은 안바닥이 넓고 편평하게 만들었다. 문양은 미립으로 정제된 백토니(白土泥)와 자토니(裏土泥)를 붓에 묻혀 그리는 퇴화(堆花) 기법으로 그려 넣었다. 뚜껑에는 간략한 꽃잎을 그리고, 주전자의 앞·뒷면에는 활짝 핀 큼직한 화문(花文)을 활달한 필치로 그린 후 주구와 손잡이 등에는 흑색과 백색의 조화를 고려하면서 그렸다. 승반에는 외측면 세 곳에 일정한 간격으로 간략화시킨 꽃을 그려 넣었다. 은은하고 투명한 회청색 광택의 유약을 약간 두껍게 시유하였으며 주자와 승반은 황갈색 모래비짐을 받쳤고, 뚜껑에는 백색 내화토 비짐을 받친 흔적이 남아 있다. 둥근 몸통에 굵직굵직한 주구와 손잡이가 달린 힘찬 형태, 힘 있고 빠른 필치로 그린 문양, 투명한 회청색의 유색 등 12세기의 세련된 청자 양식을 유감없이 보여주는 작품이다. This is a complete set comprising a globular ewer, a small disk-type lid and saucer with a large mouth, an everted rim and a wide, flat inner surface. Designs in relief, painted with a brush using refined white slip and kaolin, decorate the ewer. 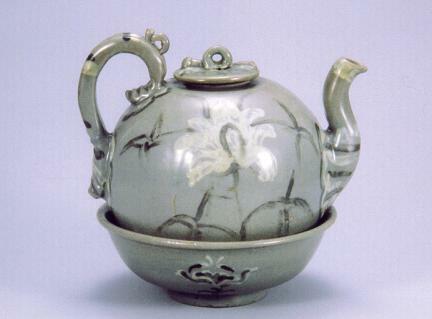 The lid is decorated with simple flower petals, while the front and rear surfaces of the ewer are decorated with large flowers in full bloom painted in vibrant brushstrokes, and the spout and handle are decorated with a harmonious mixture of black and white floral patterns. Simple flower patterns are painted in three places on the outer surface of the saucer. 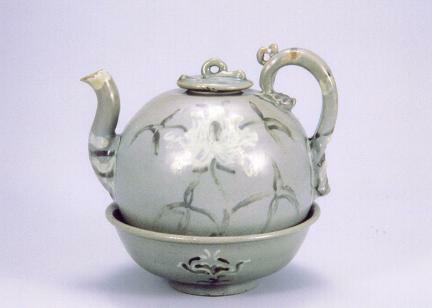 The lid, ewer and saucer are covered in a thick coat of transparent glaze of a pale grayish blue color. Yellowish brown sand spur marks are visible on the underside of the ewer and saucer, while white clay spur marks are visible on the underside of the lid. This celadon set exemplifies the refined artistic style of celadon wares in the 12th century with its stout, solid shape; patterns executed in bold, vibrant brushstrokes; and the clear grayish blue glaze.